In 30 days or less. For FREE. YOU are now one step away from joining hundreds of adults of all ages who have been enhancing their quality of life through the LBBA Martial Arts Training PROGRAM. GET READY to experience a workout that makes you mentally and physically strong while learning the BEST way to defend yourself effectively. We want to invite you to test drive our training system with our INCREDIBLE FREE INTRODUCTORY OFFER! Join our team today and learn about the hottest and most talked about self-defence training system in the world. Patience, commitment, willpower, and a positive attitude are all that you need to come prepared to class. Here’s Your Opportunity to Increase Self-Confidence And Feel Better About YOU! Stressed out? Kick it out! Many doctors are prescribing physical activity along with other measures to help combat the adverse health effects of stress. And many people are finding that LBBA Martial Arts does the job better than any other place they have previously tried. Besides the fitness benefits, karate and kickboxing training does lots to relieve the mental pressure faced by adults today. There’s nothing like punching a hand target or kicking a heavy bag to get out the day’s tensions! In fact, after one of our classes not only have you “blown off” some stress, you may find that you feel more relaxed and refreshed, ready to meet head-on those things that only an hour ago had seemed insurmountable. Each class is a total workout,incorporating both upper and lower body strenght conditioning and flexibility,increasing your aerobic and anaerobic capacity and burning off unwanted calories. There's a reason why our students are in great shape - we will help you get there too! We all experience stress in our life, whether from pressure or home life. You carnt eliminate stress but if you dont learn to manage it, you will suffer from the effects. Training at LBBA Martial Arts, gives you an outlet for your daily stress and it is guaranteed to leave you feeling relaxed and more equiped to take on lifes challanges. The combination of physical training and a positive enviornoment in our martial arts schools will be just the boost you need to renew your enthaustium for life. All of us have experienced the fear, anxiety or anger that results from confrontation with intimating people, all the damaging internal voice that consisitenly knocks your inner most confidence. LBBA Martial Arts will help you replace those feelings with self assurance and confidence. You take pride in knowing you are able to stand up for yourself in any encounter and are in control of your destiny! 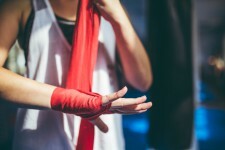 Our method of training will start with simple, low intensity techniques and responses while steadily progressing towards higher levels of energy and skills. You will learn to develop immediate muscle memory reactions that are higher effective at neutralising an attacker. But of even greater importance will be your ability to recognise that an attack is imminent and take steps to avoid becoming involved. Martial arts is an exciting activity, the challenge of learning a skill, the social aspect of training with friends and escaping from our day to day routines are all part of why the martial arts becomes a life long endeavour for millons of people. At LBBA martial arts our instructors are also students and they know why people keep coming back to class, because its FUN, FUN, FUN.